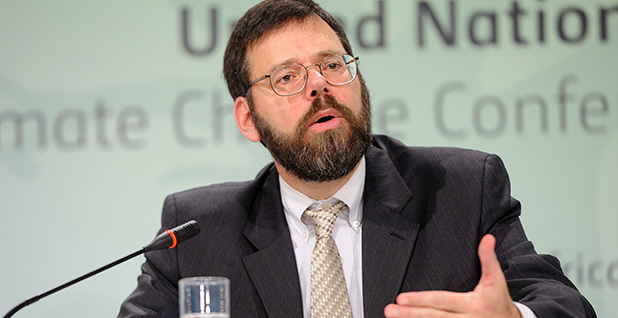 Jonathan Pershing, U.S. special envoy for climate change. Photo courtesy of the International Institute for Sustainable Development. U.S. Special Envoy for Climate Change Jonathan Pershing says that when his international counterparts ask him how the U.S. election will affect the Paris Agreement, he talks about what won't change rather than what could. In an interview with ClimateWire, the new top U.S. negotiator acknowledged that the diplomats and ministers he has spoken to since taking the post in April ask about the election "at every turn." But, he argued, from appliance standards to support for new technology to state policies to renewable energy tax credits, many of the steps the United States is taking to rein in greenhouse gas emissions will survive no matter who is in the White House next year. "To me, there's more likely to be continuity no matter who's in office," Pershing said. "The priorities are very different -- we certainly have heard different messages" from the candidates, he said. But, he added of climate change, "I believe that this is a huge problem, though, and no matter who is president, it's going to be part of what they have to deal with." The questions are not expected to abate anytime soon. The battle for the White House between the presumptive Republican nominee, billionaire real estate developer Donald Trump, and the expected Democratic nominee, former Secretary of State Hillary Clinton, will reach its peak just as negotiators meet in Marrakech, Morocco, in November for their first major round of talks since the Paris Agreement. Other changes are also afoot. The U.N. Framework Convention on Climate Change is poised to have a new boss in former Mexican diplomat Patricia Espinosa. The current U.N. climate chief, Christiana Figueres, steps down this week and is expected to throw her hat in the ring for U.N. secretary-general to replace Ban Ki-moon (ClimateWire, June 24). Figueres has not yet formally announced her candidacy, and Pershing did not directly comment on it, saying he has not been closely following the nomination process. But he said the presence of one of the Paris Agreement's chief architects would be bound to force other candidates for secretary-general to address how they would view climate change and implementation of the accord. Ban, who steps down at the end of this year, made climate action one of the hallmarks of his U.N. leadership and leaned heavily on countries to deliver more ambitious commitments ahead of the Paris conference. Pershing said that whoever replaces Ban would have a hard time minimizing an issue that so many world leaders promised publicly to tackle and that 195 countries have now pledged to address. "I think that's what he's reflecting, in some sense, and I would argue that the next generation of leaders in all of our institutions -- both in the U.N. level and in nations -- will need to prioritize this," Pershing said. "It's that level of a problem." The secretary-general doesn't take a direct role in the inner workings of the U.N. Framework Convention on Climate Change, but support from the office can mean more resources and can raise the profile of the issue. Now that a global accord has been negotiated, the world is engaged in implementing it, which is one of the reasons Pershing was widely viewed as a fitting replacement when top U.S. negotiator Todd Stern stepped down in April. In his most recent post at the Department of Energy, Pershing focused on the development and deployment of clean energy systems -- the same solutions that will help countries deliver the emissions reductions they promised in Paris. But not every negotiating issue was settled in Paris. Poor countries continue to raise concerns about when and how the developed world will deliver on its collective pledge to mobilize at least $100 billion a year by 2020 -- a sum rich countries say will substantially come from leveraged private capital. Poor countries worry that not enough of those dollars will flow to help them cope with the warming that is already unavoidable, and the Africa negotiating group and others are preparing to push for more certainty on that score later this year. But Pershing said he doesn't expect a developing-world proposal for a new, more specific adaptation pledge to "come up." "That's not a conversation that we're currently looking to have," he said. "Our sense is very different." Pershing said he has spent a lot of time this spring in New York and elsewhere talking to private-sector financiers about the role they could play in helping make the world's infrastructure more climate-resilient. He noted that BlackRock Inc. and other asset management firms are starting to focus on green bonds, which finance resilience efforts to shore up ports and other vulnerable infrastructure together with mitigation projects like green energy deployment. Their involvement, he said, will tap much more capital and activity than just what public coffers can afford. Poor country representatives he talks to are more concerned about accessing the funds that have already been placed on the table than about pushing for new commitments, Pershing said. "What I'm hearing from developing countries is an intent to find investment for the projects and programs that they've got," he said. "They're less tied to a number and more tied to the projects." Delivering climate aid has been an uphill battle for the Obama administration, with Republican majorities in Congress targeting the president's pledges to the Green Climate Fund in order to exert control over his overall climate diplomacy agenda. Last week, the Senate Appropriations Committee voted narrowly to strip GOP-backed language from a fiscal 2017 spending bill for the State Department that would have barred U.S. contributions to the U.N. fund. But the committee replaced that prohibition with a $500 million allocation -- down from the $750 million the State Department has proposed. Future contributions to the fund for poor countries will depend on who occupies the White House next year. If poorer countries have stopped pushing for new pledges of aid from the developed world, as Pershing contends, their investment decisions post-Paris indicate that they might also be adapting to the new paradigm of nationally determined commitments over pre-Paris expectations of developed and developing world responsibilities. Breaking down the traditional "firewall" between rich and poor countries in this process was one of the main aims of the U.S. team under Stern, and Pershing said he has seen little backtracking since Paris. "You've got a really different model now in which people seem to be moving away from this notion of 'As a developing country, I don't have to do anything' to 'As a developing country, I have an energy demand. I can do it with clean power, and I'm going to look for an investment opportunity here,'" he said. India, Morocco, Saudi Arabia and China have emerged as some of the leaders in new solar energy deployment during the post-Paris era, he noted. They've made those investments largely for non-climate-related reasons. Climate change has been a focus of Pershing's for much of his professional life. He holds a Ph.D. in geology and physics from the University of Minnesota, where he studied the impacts of climate change in the Great Lakes region -- which were already significant in the 1980s. As a science adviser to the State Department, he attended the first-ever international climate meeting in 1991, hosted by then-President George H.W. Bush. He remembers that 1,000 technical experts met in a convention center outside Washington Dulles International Airport -- a far cry from the star-studded confab last fall in the French capital, which drew more than 140 heads of state eager to be seen making commitments. "It's a startling large change," he said. "It's taken some time, but it's a change that affects all of our economies at a pretty fundamental level, and from that perspective, it's been very quick."